(CNN) – Pennsylvania Democrats are fuming over a comment made by a Republican state representative, who said a controversial voter identification law will help Mitt Romney carry Pennsylvania in November. The comment has Democrats on edge, as they say it further proves their argument that the law was politically motivated and created to help Republicans. Mike Turzai, the state's House majority leader, made the remark Saturday at the state's Republican State Committee meeting, according to PoliticsPA.com. After listing off a series of GOP legislative accomplishments involving Second Amendment rights and abortion regulations, Turzai mentioned the new voting law, which requires voters to show a photo ID, as one of those GOP victories. "Voter ID, which is gonna allow Governor Romney to win the state of Pennsylvania, done," he said, drawing applause. While Republicans argue the new law helps to fight fraud, Democrats make the case that the new requirement aids Republicans in the voting booth-and Turzai's comment, they say, represents further evidence of their claim. "Mike Turzai's admission that Voter ID only serves the partisan interests of his party should be shocking, but unfortunately it isn't. Turzai's comments are typical of a leader and a party that has consistently put their interests ahead of the interests of Pennsylvania," said Pennsylvania Democratic Party spokesman Mark Nicastre in a statement. Defending his remark, Turzai's office said the lawmaker was making the point that the new law prevents election fraud and levels the playing field for GOP candidates on the ballot. 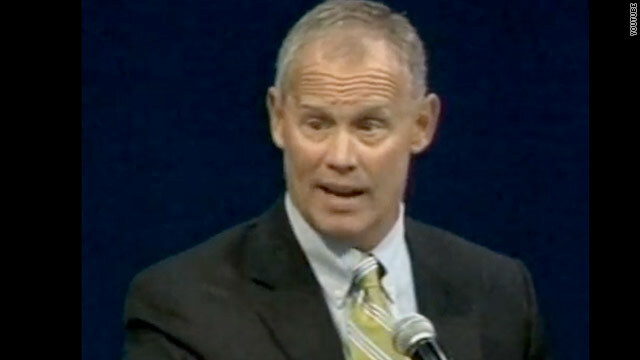 "Rep. Turzai was speaking at a partisan, political event. He was simply referencing, for the first time in a long while, the Republican Presidential candidate will be on a more even keel thanks to Voter ID. The reference was nothing more than that to a statewide Republican crowd," his spokesman, Stephen Miskin, said in a statement. While a Republican presidential candidate hasn't won Pennsylvania since 1988, the state made big GOP gains in recent years and has a Republican governor and one U.S. senator. Recent polls, however, show Obama in the lead in the Keystone State. A Quinnipiac survey released earlier in June indicated the president held a 46%-40% advantage over Romney in Pennsylvania. - CNN's Justin Lear contributed to this report. In fact, high voter turn out is the bane of Republican existence. That's why they made it even more difficult to register to vote. and if none of that works, the stacked SCOTUS ruling on the Citizens United case allows them to basically buy the election. The point is, they can not allow something or someone like Barack Obama to ever happen again. So basically Turzai is saying that if a Democrat wins an election, it obviously is the result of voter fraud. That's really insulting, considering that there were exactly 6 instances of voter fraud in Pennsylvania in 2008. It's also insulting to assume that all US adult citizens have either a driver's license or passport. Many do not, nor do they have the birth or marriage certificate necessary to obtain photo IDs. The burdens they have to overcome to obtain these discourage many from even trying (this may come as a shock to Republicans, but not everyone has their own car, not everyone has Internet access, and not everyone can take a day off from work to go to a government office to get these documents). And no, not all photo IDs are acceptable under the voter ID law - acceptable IDs must have the person's photo, address, and an expiration date. That disqualifies college and employee IDs. There really is no doubt here: these laws are designed to prevent Democrats from voting. "Defending his remark, Turzai's office said the lawmaker was making the point that the new law prevents election fraud and levels the playing field for GOP candidates on the ballot." So I guess that means that most of the people who commit voter fraud are Democrats according to Mr Turzai's talking office – right?. WTF is that all about? It's the Republicans who consistantly lie so I'd assume they were more prone to voter fraud because they're so good at being frauds. Whatever Happened to Less Regulation? The Republicans think there are too many government regulations on corporations and are doing whatever they can to limit government regulations for the big money and their corporate cronies. Oh, haven't you heard? According to Mitt Romney, "Corporations are people, my friend." With Citizens v. United and all the other machinations of the Republican agenda, they are working really hard to ensure that corporations are like people and will have an even bigger involvement in who is elected to government. Now, as far as "We The People," and by that I mean the actual people, the Republicans are working equally hard to make it difficult for citizens to vote. The more people actually vote, the higher the turnout, and that favors Democrats. So they are doing everything they can to suppress the people's vote in order to win elections. I believe I heard that In Florida, they have actually outlawed early voting on Sunday. That is traditionally when a lot of Democratic voters go to the polls after church. So what we're seeing now is more and more regulations on voting by the actual people but less regulations on corporate involvment in elections. The right to vote for our elected leaders is one of the most basic rights that all adults in this country now possess. The time of the rich white guy being the only voter in this country has long since past. I suspect the Republican machine would love to go back to a time when rich white guys made all the decisions. With every move they make, they are increasingly trying to take this country backwards to that time. If you believe the Republican's line that they are actually trying to protect your freedom, well, you are kidding yourself. If youth, women, and minorities were traditionally Republican voters, do you think we'd be seeing any vote suppression activity to protect our freedom? I suspect not. On the subject of protecting freedom of the people versus the big corporate machine, their hypocrisy knows no bounds. To Vote the Tea Party OUT in 2012 – thank you so much for responding to my question. Don't students have ID's? Kids usually have a driving learners permit or a college ID in this country, don't they? I've seen kids with State ID, am I wrong? It will help Romney win, and fight fraud at the same time, because the majority of voter fraud in the form of felons voting and illegitimate registration is perpetrated in favor of Dems. This isn't to say there isn't significant voter fraud from the right, but it is more prevalent on the left. Over the last ten years there have been 1730 convictions for voter fraud, most originating from ACORN affiliated democrats and the 2008 Minnesota election. 73 % of those convicted were either democrats or affiliated in some way with the democrat party. so you admit that there were attempts to get fraudulent names on the voter rolls. thank you. since that in itself accomplishes nothing why would you not believe that the fraud would not continue to its logical conclusion of a fraudulent vote being cast? why else would one bother to register fraudulent names? there is not point to that.